Who Benefits from Stand Your Ground Laws? Is "Stand Your Ground" laws a license, an excuse to use force or to kill? Photo Credit: aattp.org. Who benefits from "Stand Your Ground" laws and statutes? "Stand your ground" statutes benefit whites more than blacks, are unnecessary and cause minority men to live in fear, several experts said Friday to the U.S. Civil Rights Commission as it evaluates racial disparities in the laws. But one dissenter, an African-American lawmaker from South Carolina, said the law benefits black defendants by putting in place an extra hurdle in the way of arrest by police officers who may have hidden racial biases. "Stand your ground, the way I intended when I voted for it, it's meant so people don't have to live in fear," said Democratic state Rep. Todd Rutherford. Rutherford's voice was in the minority among more than a dozen experts who testified before the U.S. Commission on Civil Rights in Orlando during their only "field" hearing outside of their base in Washington. 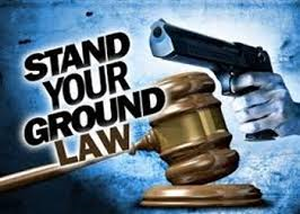 "Stand-your-ground" laws provide that individuals have no duty to retreat from a place where they have a right to be and may use any level of force, including lethal, if they reasonably believe they face an imminent and immediate threat of serious bodily harm or death. One commissioner was skeptical of the benefits of "stand your ground laws," saying they pervert traditional self-defense laws. "The problem with all this is that people are dying," said Commissioner Michael Yaki, a former member of the San Fransisco Board of Supervisors who runs a consulting firm. The laws in around half of the 50 states came under renewed scrutiny in 2012 following the fatal shooting of an unarmed Trayvon Martin, a black teen, in a Sanford, Florida, town house complex by neighborhood watch volunteer George Zimmerman, who identifies himself as Hispanic. While Zimmerman didn't invoke a part of the law that allows for a an immunity hearing, during which a judge decides whether the case moves forward or is dropped, "stand your ground" defense language was included in the jury instructions at his trial last year. Zimmerman was acquitted of all charges in Sanford, about 30 miles from where Friday's hearing was held. The commission decided to examine "stand your ground" laws after Martin's fatal shooting, said Martin Castro, the commission's chair. Next year, the commission will issue a report with recommendations for President Obama and Congress. "It will be beyond anecdote, but concrete statistical information," Castro said. In a white-dominated society, where the majority tends to project its fears on young men of color, "stand your ground" laws have made young black and brown men fearful, said Ahmad Nabil Abuznaid, a co-founder of the activist group Dream Defenders. "People are perceived as threats when they just really want to live their lives," Abuznaid said. Attorney Benjamin Crump, who represented Martin's family and the family of Michael Brown, the unarmed black 18-year-old who was shot by a white police officer in Ferguson, Missouri, said there is no need for "stand your ground" laws. He said they are unconstitutionally vague since not one person is going to agree on what constitutes "reasonable fear." "Stand your ground was a solution looking for a problem," Crump said. What DOES constitute 'reasonable fear'? Fear is such a vague emotion when compared amongst millions of individuals. There are people who jump out of planes, go through haunted houses, hold spiders/snakes, swim with sharks, and practically have no sense of fear at all! Unless 'fear' is defined more specifically do I think this law could be effective. I do think people shouldn't have to live in fear of their lives, but I can definitely see how this law could cause racially biased people to get away with unlawful things. Without defining more with what the actual fear is it is hard to say if the law could be effective. I am afraid that this law will be taken advantage of. People who really need to retreat should not "stand their ground" when they are in immediate danger. If a police officer tells someone to leave, that person needs to understand that the officer has authority over them. The majority of officers do what they do in order to protect us. They know better than we do about certain situations and someone should not be allowed to stay in a dangerous location just because they are afraid to leave. I agree with PARKF2014-16- people need to understand the authority that the police have over them. I think it's a mix between the police being just a tad trigger happy but also a good portion of it being that a lot of people have this "f*** the cops" strategy. Both get us no where. That is a very good point in the sense of some laws are worded to help others out and put others down. Being specific when laws are written is probably a good idea. In this case this was the issue, fear can be defined by many different people living completely different lives. One's that jump out of airplanes or scream at the spiders crawling next to them, fear is there in everyone. Even if someone doesn't want to admit it. For those that are fearing their life because of a law and specifically because the color of their skin is different, is not excuse or good reason to let them live in fear. I so agree with PARK2014-17 What is fearful to one person, is not to another. No one should have to live with it. Unfortunately there is no real way to stop it completely. We create it as we live our lives daily. As babies we know NO fear. As we live and grow we begin to create our boundaries and fears. So unless these laws are created and can really do something effective what is the point? While reading this article, I couldn't help but think of not only how vague this law is but how it could also be potentially harmful. From what I read, it is impossible to tell what constitutes as reasonable fear. If you create a law and cannot define the essential parameters of what the law embodies, then it will most definitely be taken advantage of. For all we know people could go around town shooting people and claim that they believed someone was forcing them to leave a place they had the right to be at. I mean, how do you begin to resolve this issue? I can foresee so many problems with this law. In my opinion, either they get rid of it completely or find a way to revise the law. I agree. I do not think this law should have ever become a law. I honestly cannot believe that it was passed. Like you mentioned, there are so many problems with this law. I can see people getting hurt. Two young, African-American men lost their lives, but this law does not fix that. If anything, it could easily lead to more deaths. Although racism is not as bad as it once was, it is still not good. There are many people still who are hidden racists or out in the open, depending on their social standings. Although racism is still not good this does not give people the right to "not stand down" at any level of force! In my opinion this is almost asking for trouble, no it most definitely is asking for trouble. If my mom and dad had told me as a child to stand up to my older brother no matter what type of force I had to use, even if it meant lethal. I would have no older brother left! This law should be enforces but only to a certain degree of freedom. In my eyes this law didn't need someone(s) to die in order for it to get relooked at. It should of never been passed in the first place. If we didn't already have a self defense law then it may had been needed to a certain degree but we do happen to have a self defense law that has served its purpose for so many years before, we didn't need something else influencing us to kill. In this article they stated they stand our ground law has young black and brown men fearful for their lives and it should, everyone should be fearful. This law wasn't just enforced for the whites to use, roles could be very easily reversed for the white men and woman to be fearful too. My favorite sentence in this whole article was "Stand your ground was a solution looking for a problem," this sums the whole article up. Stand your ground laws just need to be thrown out the window. not only have two African American boys been shot and killed, but nobody is being punished for their wrong doings. once its aired on television it becomes media hype. my biggest issue is after the wrong doings of the people what do you do for the families? you cant bring there son back, you cant repay them... you cant do anything for the family. if somebody did that to my son I would want them to suffer the way I was suffering. I agree that the laws need to be thrown out the window. I can only see tragedy coming from them. I do not think they would help at all. Police officers should not shoot someone who is unarmed and not advancing towards them. There have been reports that Michael Brown was doing both of these things. As a citizen, I would want the police officer to disable someone who is harmful to other citizens around them. If Brown truly was a threat, people should not be crying out for justice. This article had an interesting view on the bias the young African American's live their lives. "Living in constant fear" is not a good way to live. For those that do that to the young people of this nation, it's so upsetting. Ferguson was hard to hear about and for days after hearing about how the people in that city was dealing with it was hard to hear about. For going through this, I feel that the nation should be better informed on what is going on and how people can go about it. Threats can be misinterpreted but for those that are trying to live their lives, it should be looked at much closer in a way that all people are heard. That means that individuals from both sides of the line have an opinion and be able to share it even if some don't agree. That's what this country is known for and that's what we need to work towards even though it's the 21st century, we have lots to work on and improve on for this country to be safe for everyone. This law in my opinion could be taken advantage of and will not help everyone. I believe that if maybe we all could respect our policing systems and justice systems maybe they would respect us back? police are armed and ready for action. this being said stand your ground should be common idea among police and the law its self should only apply to citizens. however the law is indeed foggy and too broad to be seriously considered, repeal it son. The stand your ground laws are controversial and may be considered unconstitutional but it is the matter of racism in the court systems that is at the heart of the question. perhaps if race was set aside in the judicial decisions made we would have a better understanding of these events of controversy. we might also begin to see if these laws that allow "self defense" are truly wrong. This is such a good point with the part about it being racism in the courts. Standing up for what you believe with a fair trial is so important in a democracy type government. But now that the government runs so many aspects of life this viewpoint is being turned down which is not fair. It's so hard to set aside the race card in this day and age since there are so many individuals that have a predisposition about what is best and who should be on time. This view can be universal throughout families and cultures even. I did a paper about other cultures viewing the United States and it was sad to hear how different their views were than our reality. That could be applied to this in the sense of who views the circumstance and what there emotional or psychological viewpoint is with it. Great conclusion to an interesting article. Good stream of facts, although research into some of the statistics are left up to the reader, you left us with good starting points. Any unarmed American is always at risk. Most U.S. law abiding citizens knew & know this already, it's only news to liberals who believe there educated to a higher calling of information. It's the Al Sharpens & Jessie Jacksons who know there low information voters buy anything they say as long as there is a materialistic rewards in return because bending the truth has become an art to a income to all media liberals who forgot how to tell the truth & have become comfortable not even coming close to it to & create chaos there so proud of. Part affiliation doesn't mean anything anymore when it comes to the truth, it's those seeking power through the press that's sickening to say the least. I personally dont agree with this law because people already died innocent from it! Like PARK09 I don't agree with this law at all. This law is basically just telling people to kill if you want, do what you want, and that they will get away with it, as long as you throw the stand your ground law up in the air. Its like the real life purge! If this were to actually get passed one day it is a good way to get rid of my enemies. Who need self-defense anymore. This is the reason self-defense is already a law, we don't need a stand your ground!